Nothing adds years to your smile’s appearance more than discoloration. While tooth discoloration is a normal part of the aging process, there are multiple factors that can accelerate the discoloration of teeth. Certain foods are known to cause yellowing, browning, and stains on the teeth to develop. However, if you have noticed that your smile has started to dull, teeth whitening in Dallas will reverse the discoloration to give you a younger, revitalized smile. To keep your new smile as white as possible, you will need to avoid the top stain causing foods. There are a number of foods and beverages that are known to stain teeth. Foods than contain high levels of acid, sugar, and dark pigmentations are top culprits for tooth discoloration. Enamel has tiny pores that’s aren’t visible to the naked eye. However, when the teeth are exposed to stain-causing foods, the pigmentation seeps into the enamel. If acid or sugars are also in the foods, this intensifies the rate of discoloration as they cause the enamel to weaken. Tomato products contain high amounts of acid, as well as dark pigmentation. The high level of acidity causes the red pigmentation to cling to the teeth, which leaves the teeth exposed to staining. Not only will tomatoes cause staining, but pasta sauces, tomato juices, and even ketchup can lead to discoloration. If you must eat tomato-based products, also eat dark vegetables. Dark vegetables create a film over the teeth to act as a barrier. Acidic and sugary beverages are huge culprits for tooth discoloration. Drinks like coffee, tea, soda, red wine, and even sports drinks stain teeth and eat away at tooth enamel. While it isn’t always possible to avoid these beverages, it’s best to drink through a straw to limit contact with the teeth. While berries are loaded with antioxidants, they will stain your teeth. Dark berries, like blue berries, have a dark pigmentation that will sit on your teeth and cause discoloration. No matter if you’re eating berries or drinking berry juice, you need to brush your teeth promptly to remove the stain-causing residue. Curry is an amazing spice that tastes great, but the dark pigmentation of the spice will lead to discoloration. If you’ll be eating curry, be sure to also have a salad on the side or eat some vegetables to help prevent the stains. Balsamic vinegar is a healthy salad dressing that can cause damage to your teeth. The vinegar in the dressing will amplify the stain-causing potential of the dressing’s ingredients. Therefore, it is best to brush your teeth right away after eating it. If your teeth have begun to dull, it’s time to visit your cosmetic dentist in Lakewood. 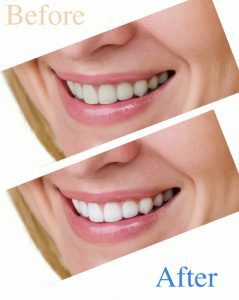 Vanderbrook and Hoppe Dentistry offers teeth whitening in Dallas to restore your beautiful smile. Call us today at (214) 989-3708 to benefit from professional teeth whitening. We will remove the stains for a whiter, younger-looking smile.